It was the first day of Sukkot, and all the congregants in the shul (synagogue) of Rabbi Elimelech of Lizensk were in a festive mood. One could feel the "Yom-Tov" spirit in the atmosphere. As Rabbi Elimelech stood at the lectern and began reciting Hallel, all eyes turned upon him. There was something unusual in his manner this Sukkot. Why did he stop so suddenly in the middle of his swaying as he held the etrog and lulav in his hands to sniff the air? And why did he not go through the Service in his usual leisurely manner? It was evident that something was on his mind, something rather exciting by the look on his radiant countenance. The minute the davening (praying) was over, Rabbi Elimelech hurried to where his brother Rabbi Zusha (who had come to spend the festival with him) was standing, and said to him eagerly: "Come and help me find the etrog which is permeating the whole shul with the fragrance of the Garden of Eden!" And so together they went from person to person until they reached the far corner of the shul where a quiet looking individual was standing, obviously engrossed in his own thoughts. "This is the one," called out Rabbi Elimelech delightedly. "Please, dear friend, tell me who are you and where you obtained this wonderful etrog?" "With all due respect to you, Rabbi, it is quite a story. Do you wish to sit down and listen to it all?" "Most certainly I do," answered Rabbi Elimelech emphatically, "I am sure it will be a story worth hearing!" "My name," began the quiet-looking man, "is Uri, and I come from Strelisk. I have always regarded taking the "four kinds" on Sukkot as one of my favorite mitzvot, and so, although I am a poor man and could normally not afford to buy an etrog according to my desire, my young wife, who agrees with me as to its importance, helps me by hiring herself out as cook. Thus she is independent of any financial help from me, and I can use my own earnings for spiritual matters. I am employed as melamed (teacher) in the village of Yanev, which is not far from my native town. One half of my earnings I use for our needs and with the other half I buy an etrog in Lemberg. But in order not to spend any money on the journey I usually go on foot. "This year, during the Ten Days of Repentance, I was making my way on foot as usual, with fifty gulden in my purse with which to buy an etrog, when on the road to Lemberg I passed through a forest and stopped at a wayside inn to have a rest. It was time for 'minchah' so I stood in a corner and davened minchah. "I was in the middle of my prayers when I heard a terrible sound of moaning and groaning, as of one in great anguish. I hurriedly finished my davening so that I could find out what was the trouble, and if I could help in any way. "As I turned towards the man who was in obvious distress, I beheld a most unusual and rough looking person, dressed in peasant garb with a whip in his hands, pouring out his troubles to the inn-keeper at the bar. "From the somewhat confused story, between his sobs, I managed to gather that the man with the whip was a poor Jew who earned his living as a baal agallah (owner of a horse and cart for carting purposes). He had a wife and several children and he barely managed to earn enough to make ends meet. And now, a terrible calamity had be fallen him. His horse, without which he could do nothing, had suddenly collapsed in the forest not far from the inn, and just lay there unable to get up. "I could not bear to see the man's despair and tried to encourage him, by telling him that he must not forget that there is a G‑d above us who could help him in his trouble, however serious it seemed to him.
" 'I'll sell you another horse for fifty gulden, although I assure you he is worth at least eighty, but just to help you out in your difficulty!' " The inn-keeper was saying to the wagon driver.
" 'I haven't even fifty cents, and he tells me I can buy a horse for fifty gulden!' the man said bitterly. "I immediately took out my purse and banded him forty-five gulden, the wagon driver looking on, his eyes nearly bulging out of their sockets in astonishment. He was just speechless with relief, and his joy was absolutely indescribable. "'Now you see that the Almighty can help you, even when the situation appears to you to be entirely hopeless!' I said to him as he hurried off with the innkeeper to harness the newly-bought horse to his forsaken cart tied to the stricken horse in the forest. "As soon as they went off, I hurriedly got my few things together and disappeared, as I did not want to be embarrassed by the thanks of the grateful wagon driver. "I eventually reached Lemberg with the remaining five gulden in my pocket, and naturally had to content myself with buying a very ordinary looking but kosher etrog. Usually my etrog is the best in Yanev, and everyone used to come and make a blessing over it , but this year I was ashamed to return home with such a poor-looking specimen, so my wife agreed that I could come here to Lizensk, where nobody knew me." "But my dear Rabbi Uri," cried out Rabbi Elimelech, now that the former had finished his story, "Yours is indeed an exceptional etrog. Now I realize why your etrog has the fragrance of the Garden of Eden in its perfume! Let me tell you the sequel to your story." "When the wagon driver whom you saved thought about his unexpected good fortune, he decided that you must have been none other than the Prophet Elijah whom the Almighty had sent down to earth in the form of a man, in order to help him in his desperation. Having come to this conclusion the happy wagon driver looked for a way of expressing his gratitude to the Almighty, but the poor man knew not a Hebrew word, nor could he say any prayers. He racked his simple brain for the best way of thanksgiving. "Suddenly his face lit up. He took his whip and lashed it into the air with all his might, crying out with all his being: 'Dear Father in Heaven, I love you very much! What can I do to convince you of my love for you? Let me crack my whip for you as a sign that I love you!' Saying which, the wagon driver cracked his whip into the air three times. "On the eve of Yom Kippur, the Almighty up above was seated on His 'Seat of judgment,' listening to the first prayers of the Day of Atonement. "Rabbi Levi Yitzchak of Berditchev, who was acting as the Counsel for Defense on behalf of his fellow Jews, was pushing a wagon full of Jewish mitzvot to the Gates of Heaven, when Satan appeared and obstructed his path with piles of Jewish sins, so that Rabbi Levi Yitzchak just got stuck there. My brother Rabbi Zusha and I added our strength to help him move his wagon forward, but all in vain; even our combined efforts proved fruitless. "All at once, the Angel Michael appeared, leading a horse, followed by the wagon driver with whip in hand. 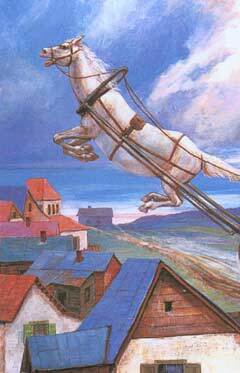 "The Angel Michael harnessed this horse to the wagon of mitzvot, and the wagon driver cracked his whip. Suddenly the wagon gave a lurch forward, flattening the piles of sins that had been obstructing the way, and drove it smoothly and easily right up to the Throne of Honor. There the King of Kings received it most graciously and, rising from the Seat of judgment, went over and seated Himself on the Seat of Mercy. A happy New Year was assured." "And now dear Rabbi Uri" concluded Rabbi Elimelech, "you see that all this came about through your noble action. Go home, and be a leader in Israel! For you have proved your worthiness, and you shall carry with you the approval of the Heavenly Court. But before you go, permit me to hold this wonderful etrog of yours, and praise G‑d with it." Thanks for sharing this story. It goes to confirm that every good deed is recognized in heaven, and has a way of rewarding whoever that participate in doing good. Great story. Just goes to show how the ripples of kindness can spread far and wide. And behold -- this is the very holy Rebbe Uri, the Seraph of Strelisk! The sequel. I enjoyed reading the story but I found that the sequel was hard to understand.